This fall, Tanya Calamoneri joins the Colgate faculty as a visiting assistant professor of English in the University Theater, teaching courses in contemporary dance and dance imagery and improvisation. Calamoneri (BA, American University; MA, New York University; PhD, Temple University) comes to Colgate from the Brooklyn Academy of Music, where she has been project manager for DanceMotion USA for the past two years. She also brings teaching experience from Temple University, New York University, and New College of California. Calamoneri’s dissertation title is “Becoming Something, Becoming Nothing: Performer Training Methods in Hijikata Tatsumi’s Ankoku Butoh.” Her teaching specialties and research interests include dance technique and creative process, dance cultural studies, somatic studies, ethnographic research, and movement and consciousness studies. We are so excited to have Professor Calamoneri on campus! Her classes and expertise extend beyond the studio by encouraging students to think about dance in new ways. 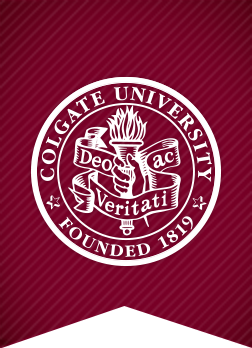 We hope to see the continuation of dance within the academic realm at Colgate!